“The sound quality might be the first thing that strikes you when listening to this transfer [which] presents a completely different sonic world. The orchestra and the voices have color, there is real dynamic range (painstakingly restored by Richard Caniell), and the sense of artificial compression hanging over all prior releases is gone. This comes close to what one might expect from a well-produced 1937 studio recording….This performance has long been available in transfers that did it little justice with their pinched, compressed sound resulting from heavy-handed noise suppression. In addition, many of those releases removed all applause in order to squeeze the performance onto two discs, thus removing some of the important atmosphere surrounding a live performance. Immortal Performances has opened up the sound remarkably well, and restored the applause. It also filled in the third disc with interesting material too. ….there is more compelling drama and intensity to be heard in the Salzburg performance. There is a warmth and flexibility to the conducting in Salzburg that provides a strong contrast to the sharply accented dramatic moments in the score….What is really astonishing in this performance is the almost perfect singer-orchestra ensemble, even in the fast ensembles….If your image of Walter is one of the genial, easy-going conductor who might lack somewhat in dramatic intensity, this performance will come as a shock to you. The drive and white-heat he brings, for instance, to the finale of Act I is quite remarkable. At the same time, he is outstanding in his flexibility and warmth in the lyrical moments. He and Borgioli, for example, are completely in synch in ‘Il mio tesoro’, and the same can be said for Walter and Rethberg in ‘Non mi dir’. 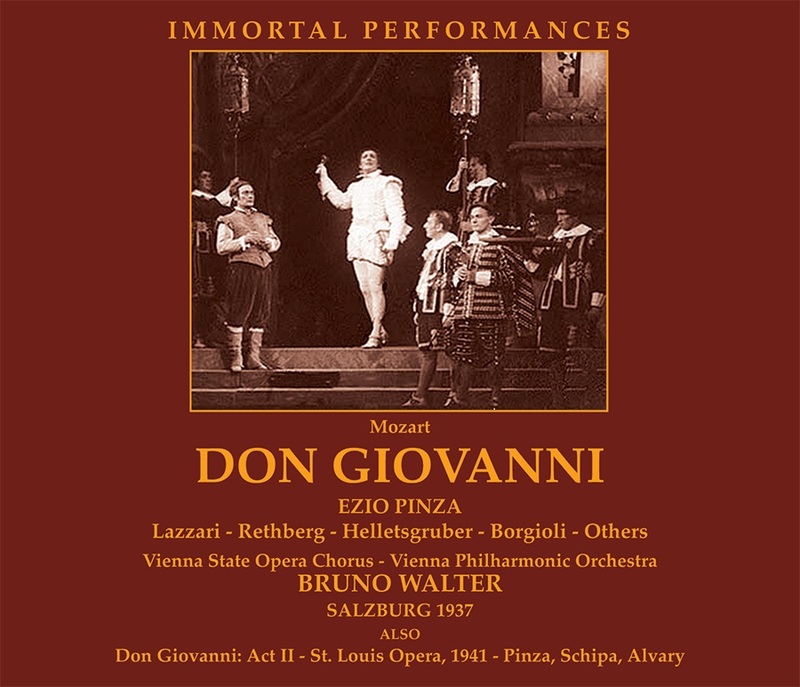 As for Pinza, he remains the greatest Don Giovanni on records, but again I have to give a nod of preference to this 1937 Salzburg performance….there is more richness of color in the timbre here, something not apparent on prior releases of this performance. Surely one of the greatest bass voices since the invention of recordings, Pinza added to his vocal abilities a keen sense of drama and intelligent and innate sense of musical style (despite the fact that he reputedly could not read music). He worked closely with the great conductors (particularly Toscanini, Serafin, and Walter) and absorbed ideas from all of them. His Don is always suave, always has an extraordinarily strong presence, whatever the scene. His singing in ‘Là ci darem la mano’ could seduce a stone, and the same for his Serenade. His characterization of the Don encompasses the intimate and tender and the overtly machismo aspects of his character (e.g., the graveyard confrontation with the statue-come-to-life). His rhythmic pulse is innately firm, and the evenness of his tonal emission is a model for all singers. Elisabeth Rethberg was, of course, also one of the great singers of her generation. She was 43 at the time of this performance, and had been singing for 15 years, mainly very heavy roles. Therefore, a touch of sheen has gone from the voice, but only a touch. Her first scene is a bit harsh, but I have never heard it not be so. I don’t think it represents Mozart’s best vocal writing, even considering that he was trying to reflect the drama of the moment. But her two big arias are splendidly sung, with firmness of line and beauty of tone….the elegance of Rethberg’s singing and the beautiful glow in the center of the voice make her Anna…more satisfying….Helletsgruber manages the coloratura demands of [her] role very well and convincingly portrays an Elvira whose principal characteristic is pride, rather than desperation (as we often hear)….Dino Borgioli is truly remarkable here. This tenor flew under the radar during his career because of Tito Schipa’s fame, but he did make the first electrical recordings of RIGOLETTO and THE BARBER OF SEVILLE and had a very important career (despite singing for only one season at the Met). I know of no performance of this opera in any recorded form that can boast an Ottavio better than this (and possibly none as good). The tone is sweet and caressing, the breath control is almost as impressive as McCormack on his classic recording of ‘Il mio tesoro’, and the character comes across not as a wimp but as a man with convictions and honor at the core. When old-timers talk about ‘Golden Age’ singing, this is what they mean. The bonus tracks are surely worthy additions to the Mozart and the Bruno Walter catalogs. The first part of the second Act of DON GIOVANNI from a 1941 St. Louis Opera broadcast is in particular valuable because of Tito Schipa’s Ottavio. Unfortunately, the broadcast network had its inflexible rules about broadcast length, and the announcer comes in right over the great tenor during ‘Il mio tesoro’. Caniell edits in the completion of the aria from Schipa’s 1927 RCA recording. A more valuable bonus is the complete performance of Mozart’s ‘Haffner’ Symphony, from a 1953 New York Philharmonic broadcast. This performance dates from around the time Walter recorded many of the late Mozart symphonies with the New York Philharmonic for Columbia….This live performance compares favorably to the studio recording, with a bit more intensity of playing, more abandon in the outer movements particularly. There is a wonderful edge-of-the-seat quality from the finale that one doesn’t get in the studio recording…. 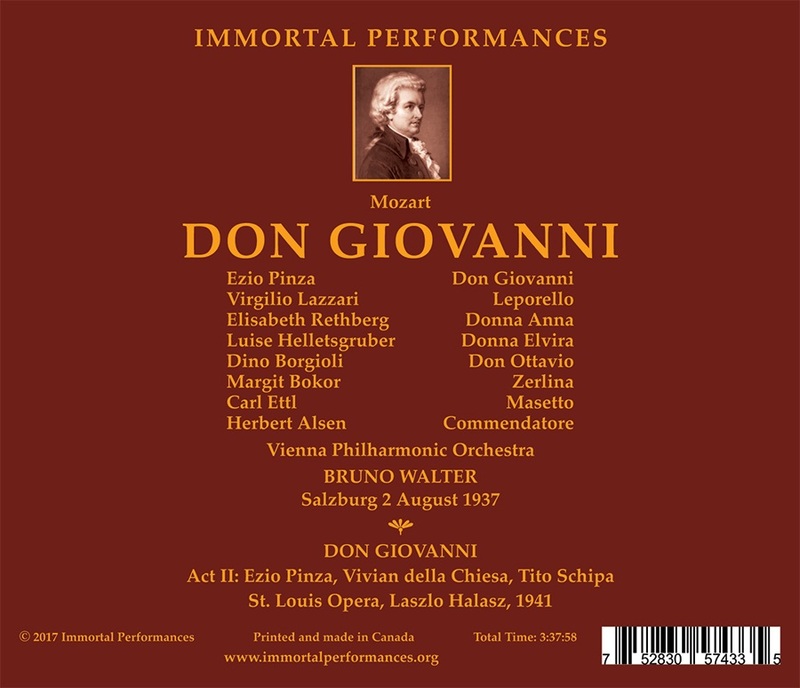 “In August of 1937 at the Salzburg Festival, Bruno Walter led a handpicked cast of international artists and the Vienna Philharmonic in performances of Mozart’s DON GIOVANNI. We are indeed fortunate that one of the performances was preserved by a Selenophone, a machine that used film stock to make audio recordings. This performance has previously been issued by several labels that specialize in live recordings. Richard Caniell and Immortal Performances have taken painstaking efforts to restore the Selenophone recording, and for good reason. There is no question the 1937 DON GIOVANNI is one of the great realizations of this masterpiece. Walter and the Vienna Philharmonic set the stage from the very start, with a searing rendition of the Overture’s opening chords, the same ones that, in the final scene, accompany the arrival of the statue of the murdered Commendatore, summoning Giovanni to account for his many sins. The ensuing chromatic and dissonant writing in the slow-tempo introduction (taken very broadly) is played to the hilt, giving the music an almost Romantic flavor. From there, the music segues to the principal Molto allegro (perhaps Mozart’s instrumental portrait of the Don himself). Here, the music is all energy, optimism, and deftness. And because Walter and the Vienna Philharmonic interpret the slow-tempo introduction with such intensity, the ensuing contrast is all the more striking, and the effect all the more exhilarating. I go to some lengths to delineate all this because I believe that the entirety of this 1937 DON GIOVANNI, perhaps as much as any performance I’ve ever heard, achieves an ideal balance of the elements of light and dark that are the substance of Mozart and Lorenzo da Ponte’s dramma giocoso. To give just one more example, Luise Helletsgruber, a superb Donna Elvira, performs ‘Mi tradì’ not only with admirable technical assurance and elegance, but also with the kind of emotional intensity that would not be out of place in a verismo opera. Helletsgruber’s rendition is truly the cry of a broken heart. That performance, impressive in its own right, makes the comedy at the start of the Cemetery Scene all the more pointed. And that comedy, in turn, makes the initial confrontation with the Commendatore’s statue doubly chilling. I could cite literally dozens of such moments of light and shade that appear throughout this unique and brilliant performance, if space allowed. The Salzburg principals are, with one exception, uniformly outstanding. First and foremost of course is the Giovanni of Ezio Pinza, who possessed all of the attributes to be a Don for the ages. Pinza was a stunningly handsome and charismatic man with one of the most beautiful bass voices of the 20th century, attributes that on their own would have assured a grand career in the world’s great opera houses. But to Pinza’s credit, he was a serious and demanding artist who refined his portraits to an exacting musical and dramatic level. And few artists relished wedding the Italian language to musical expression as did Pinza. In this 1937 performance, Pinza is in his finest voice, phrasing suavely and employing a host of vocal colors (listen, for example, to how he connects the recitative to the duet, ‘Là ci darem la mano’). This is a Don Giovanni who, at every moment, relishes the power his social class and charisma accord him. But in the final confrontation with the Commendatore’s statue, Pinza’s Don, for the first time, betrays a palpable sense of fear. He quickly gathers himself, becoming angry and defiant, before the final descent into Hell. There are several documents of Pinza’s Don Giovanni, both in studio excerpts, and live performance, but this one strikes me as the best. Pinza’s Don has a most worthy foil in bass Virgilio Lazzari as Giovanni’s servant Leporello. For the greater part, Lazzari, another singer expert in using the Italian language to musical and dramatic effect, plays his role with great subtlety. The only exception is a very broad (and very funny) depiction in the final scene of the moment Leporello is caught stealing some of the Don’s food. The wonderful Italian tenor Dino Borgioli is a first-rate Don Ottavio. Borgioli sings beautifully and aristocratically throughout, but this is clearly also a Don Ottavio with spine, a man who would not be afraid to confront the Don. Borgioli does need several breaths to negotiate the run on ‘tornar’ in ‘Il mio tesoro’ (performed at a measured tempo), but he does so with elegance and musicality. Like Pinza and Lazzari, Borgioli is a master of Italian diction and color. Carl Ettl is a fine Masetto, one who, like his colleagues, does not overplay the comedy. The only chink in the armor on the men’s side is the Commendatore of Herbert Alsen, who is pressed by the role’s demands. It is a credit to Pinza, Walter, and the Vienna Philharmonic (who play magnificently throughout) that the final scene nevertheless does not lose an ounce of dramatic fire. The trio of female leads is likewise of the highest order. At the time of this performance, soprano Elisabeth Rethberg was in her early 40s, and had already performed such roles as Aida, Sieglinde in DIE WALKÜRE, Elsa in LOHENGRIN, and Leonora in IL TROVATORE. Still, Rethberg maintained the vocal flexibility and shimmering tone that are an ideal match for Mozart’s Donna Anna. Rethberg sings beautifully, always conveying Donna Anna’s nobility and passion. Like Helletsgruber’s interpretation of ‘Mi tradì’, Rethberg’s magnificent and heartfelt performance of ‘Non mi dir’ ideally sets the stage for the ebb and flow of the opera’s final scene. Luise Helletsgruber (a mainstay at the Glyndebourne Festival during the mid-1930s) as previously mentioned, is outstanding as Donna Elvira. Helletsgruber makes Elvira a three-dimensional character, a person who knows her continued infatuation with the Don is self-destructive, but cannot help herself. Margit Bokor brings a lovely lyric soprano voice, admirable musicality, and the refusal to engage in the kinds of stock soubrette mannerisms that mar some other performances of Zerlina. The Selenophone recording of this performance, housed in the New York Public Library, posed many problems, including cramped acoustics, prominent surface noise, and variable pitch. While some past releases either applied a broad-based noise reduction system (or none at all), Immortal Performances producer Richard Caniell decided to restore the recording note by note, hand-removing each surface tick and pop, equalizing the pitch, and working to assure that the color and dynamics of the performance received the fullest possible due. The result, while still not equal to studio recordings of the time, is at long last more than adequate to enjoy this amazing performance in all its glory. 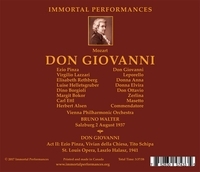 The third disc also includes an excerpt of Act II of DON GIOVANNI, broadcast from the stage of the St. Louis Opera on April 16, 1941. The sound is certainly better than its 1937 counterpart. For me, the chief raison d’être for this excerpt is the rare opportunity to hear the great Italian lyric tenor Tito Schipa in live performance. Schipa, in his early 50s, and with a wisp of a voice, conjures sublime magic with his imaginative phrasing, diction, and palette of colors. It’s a shame that the broadcast cut off his rendition of ‘Il mio tesoro’ in mid-course (Caniell uses Schipa’s 1927 studio recording to complete the aria). Finally, there is a January 4, 1953 New York Philharmonic broadcast of Walter conducting Mozart’s ‘Haffner’ Symphony, similar in approach to the artist’s fine contemporaneous Columbia studio recording, but with the extra level of intensity inspired by live performance. The booklet includes excellent and insightful notes by my FANFARE colleague James Altena, and by Richard Caniell, as well as a plot synopsis and artist bios. This is one of the truly great performances of DON GIOVANNI. Thanks to Immortal Performances for giving it new life."